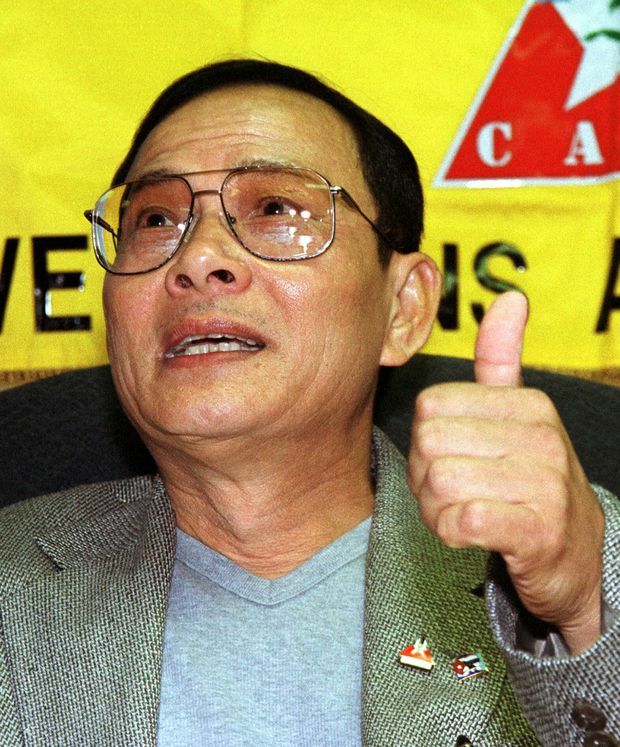 Pilot Ly Tong gestures as he responds to a reporter after receiving medals from the Brothers to the Rescue and the Cuban American Veterans Association in Miami, Monday, Jan. 3, 2000. Ly Tong, a South Vietnamese air force veteran who dropped anti-Communist leaflets over Vietnam from hijacked planes long after the war’s end, playing out the fantasies of many defeated soldiers of the south, died April 5 in San Diego. He was 74. Mr. Tong became a hero to many Vietnamese refugees in 1992, when he hijacked a commercial airliner after takeoff from Bangkok, ordered the pilot to fly low over Ho Chi Minh City – known as Saigon, South Vietnam’s capital, before the Communist victory – and dumped thousands of leaflets calling for a popular uprising. He then strapped on a parachute and followed the leaflets down to certain capture. He was released six years later and returned to the United States, where he had become a citizen after the war. Mr. Tong was born Le Van Tong on Sept. 1, 1945, in the Vietnamese city of Hue, the son of a well-to-do farmer who was executed as a revolutionary. His postwar story began in 1980, with his escape and a 17-month trek to freedom through five countries. He picked his way through minefields, he said, broke out of jails, dodged security patrols and crawled through the jungle to avoid border posts. He was accepted as a refugee in the United States, where he worked as a security guard and earned a degree in political science from the University of New Orleans. He published a 300-page autobiography, Black Eagle, which made him a celebrity among overseas Vietnamese.